Production ready versions of Apple's next-generation MacBook and MacBook Pro notebooks have surfaced stateside in matching attire, according to reports. In its attempt to provide the most accurate picture of Apple's future product plans, AppleInsider is publishing these tidbits only as a rumor to supplement earlier reports of higher conviction. According to the latest reports, both the new 13-inch MacBooks and 15- and 17-inch MacBook Pros will share similarities not only in their employment of aluminum enclosures, but in their overall aesthetic as well, with the new 13-inch MacBooks for the first time matching their higher-priced cousins as if they were members of the same product family. Again, the new designs were described as a cross between the 13-inch MacBook Air introduced this January and the aluminum iMacs that made their debut during the summer of 2007. In its April report, AppleInsider noted this would include a trimming —or tapering —around the edges and instances of black material to contrast the largely aluminum motif of the new notebooks. 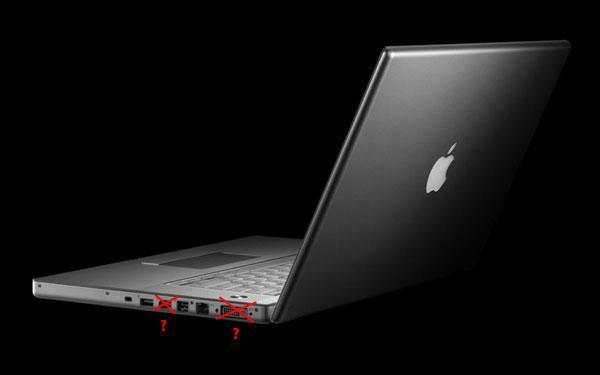 New, however, are rumors that Apple has done away with some traditional I/O ports and altered others as it strives to marginally reduce the overall footprint of its next-gen notebooks. In particular, the FireWire 400 port appears to have been removed from the new MacBook Pro, leaving a backwards compatible FireWire 800 port. In addition, the new MacBook Pro is also reported to be missing its traditional and bulky 28-pin DVI-I (Dual Link) port, which has instead been replaced with what appears to be a mini-DVI port like the one found on the existing 13-inch MacBook line and iMac line.